blends state-of-the-art design with uncompromised quality. It employs steel pins, triple-sheathed cables, and spring-loaded arms, making it one of the sturdiest retractable awning models sold. A stylish hood usually accompanies the Sunrise model when it is not secured beneath a structure. 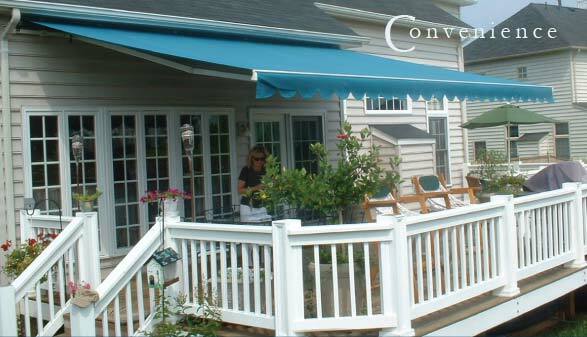 This attractive hood protects your retractable awning when it is retracted, ensuring clean, long lasting, and beautiful fabric. The integrated drip rail prevents soiling of the valance while also preserving the beauty of the fabric for even longer. This retractable awning perfectly harmonizes with your home, and, at the same time, underlines a demand for an elevated lifestyle. Host an outdoor soiree, romp around with the children or grandchildren - do whatever brings you joy in the fresh air underneath a Sunrise Retractable Awning.